I have the original 42mm Apple Watch Sport in space gray. I wear it every day except Shabbat and absolutely love it. I get tons of questions about whether I like it and how I use it from people who see me wearing it. I also read a fair amount of skepticism about Apple Watch, particularly in the developer world, so I want to describe my usage of it and make a case for why it’s a uniquely powerful new form of computer for enhancing daily life. I was a believer in Apple Watch from the get-go, but as many other users have written, the full potential was unlocked for me by watchOS 3. The ability to swipe to change watch faces and manage faces from the Watch app on the iPhone was the game-changing feature for me. That change was complemented by the new Dock of saved apps, and both were beefed up by OS-level changes that keep apps alive for quicker launching if they’re in the Dock or in complications on a saved watch face. The latter two changes made it… well, possible to use apps on the Watch Series 0, as the original model is colloquially called. (Since the Series 1 and 2 devices are much faster, they overcame the painfully slow launching of apps in more direct ways.) But easy navigation between watch faces is the feature that most supports how I mainly use the watch: as a tightly focused assistant that supports my current activity. After months of use, I’ve landed on a few contexts that seem to cover the range of things I need from Apple Watch, and I have a watch face for each one. 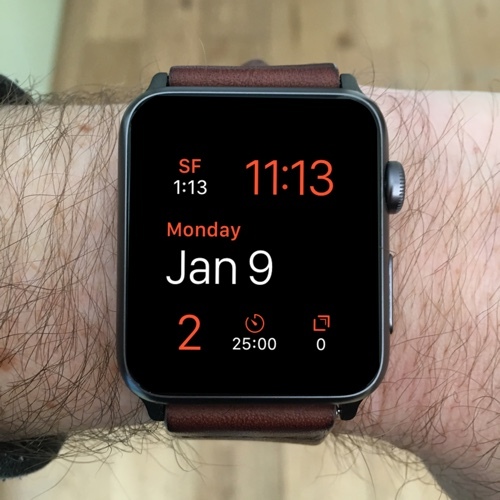 For now, I just change faces by swiping across when I switch contexts, but it’s easy to imagine a future watchOS update that switches faces automatically based on intelligently determined contexts like location, time of day or week, appointments, even who’s there with you. What really opened up Apple Watch for me was an insight about how the new input method, the Digital Crown, changes the concept of priority when organizing one’s device. Before going into how my watch is set up, it’s worth describing this new paradigm, so it’s clear how I take advantage of it in daily use. On a device with a lot of vertical screen space — basically anything bigger than a watch — we can use visual hierarchy to organize our information. We see all the relevant inputs at once, and we can use spatial awareness to navigate them and choose the right ones. In today’s desktop and mobile environments, there are two basic strategies for how to organize things, whether it’s text, photos, app icons, recipes or whatever else: lists (one-dimensional) and grids (two-dimensional). It’s not hard to imagine the jump to organizing information in three-dimensional visual space, either, as though your stuff is arrayed on a desk in front of you or on the walls around you or floating in the air. That’s what the cool kids call augmented reality and virtual reality, and we’re getting there quickly. On a watch, information that can be displayed on screen has an overriding constraint: The screen is too tiny for you to see more than one thing at a time. Apple organized the various areas of watchOS 3 into lists and grids, too — Apple Watch does have a 2D screen just like other devices — but each item in a list or grid has much more riding on it, because when the user selects it, it’s going to become the only thing they can see on their screen. A watch face is about the biggest useful grid you can fit onto this device. Apple has set the limit of how many things you can currently fit on the grid at six, that limit being the five complications available on the Modular face, plus the time. (You might notice below that I use the Modular face almost exclusively.) I find five complications to be a comfortable limit to the amount of information — comprised of displayed info and available actions — that I need in any one context. To expand the limit to other contexts, watchOS 3 allows multiple watch faces: a list of grids. But with the tiny screen that only lets you see one list item at a time, how do you navigate the list? The Digital Crown merges the familiar computer UI behavior of scrolling with the familiar watch UI behavior of turning a dial. It’s much less precise than the pixel-perfect scrolling you can do on a trackpad or touchscreen, though. (Yes, you can scroll on screen with the watch, too, but there’s so little space to move that it’s a bit silly). At first, the loss of scrolling precision on the watch drove me crazy, but then I realized that the trade-off gained me something, too. Because the nature of a watch makes changing what’s on screen a rare but important event — and because the screen is so small — the choices of what to put on screen need to be constrained to as few options as possible and prioritized severely. Things you don’t do often need to be kept out of the way, and things you never do need to be hidden entirely. Then, with a tiny control like the Digital Crown, you have to put your high-priority options in places that are dead-easy to reach. Fortunately — and I think this is the key innovation of the Digital Crown — you get four high-priority spots in a list: the immediately next and previous spots, and the first and last spot. Scrolling to intermediate items in a list with the crown is a bit tricky, but scrolling just enough to move once is easy, and cranking the crown as far as it goes either way is nearly as easy. That means your list has two directions; the starting point — wherever you currently are in the list — should be considered the middle, you have two high-priority spots on either side, and two more beyond those at the ends of the list. That means, for sanity’s sake, the things on each side of the list should be related to each other somehow, so you can further understand the list by remembering what each side is generally for. So that’s what I’ve done with my list of watch faces, as well as my apps in the Dock, and I’ve done what I can to organize the Home screen of apps this way as well. When I need to buckle down on work, I use this face, which is set to orange to match my team colors. Because I’m located in Israel this year, I keep San Francisco (home of Burning Man HQ) time visible right next to local time. The date complication is Fantastical, my preferred calendar app everywhere. In the bottom left, the OmniFocus complication shows me at a glance how many urgent tasks I have to do, and I can check them off right from my watch. The 25-minute timer is for running Pomodoro technique focus sessions, because I’m enough of a dork to believe in such a technique but not enough of one to buy a freaking app that looks like a tomato just to set timers, which Apple Watch is perfectly capable of doing by itself. In the bottom right corner, the most reachable complication for a right-handed person is Drafts. When I’m on my iPhone or iPad, this app is where I start any task for which the first action is creating text. Capturing Drafts from the watch uses dictation, and it works amazingly well. So if I’m running around busily and need to make note of something, whether it’s a to-do item, a calendar event, a post idea, or anything else that can be expressed in words, I can shout it into my watch, it will appear on my iPhone and iPad as a red badge on the Drafts icon, and then I can easily send it where it needs to go later. If Greg made Drafts for Mac and charged $100 for it, I would pay. I’m pretty devoted to my spiritual practice, and Apple Watch is an amazingly useful tool for keeping track of the many time-based practices in Judaism — even the ones based on astronomical calculations! — as well as timing meditation sessions. Because I spend so much time praying, I have allowed the new Breathe app built into watchOS 3 to reshape my meditation practice into quick moments of mindful stopping scattered throughout the day. I love that this is built into Apple’s mobile platform. I have Breathe reminders set to every three hours no matter what face I’m using, but when I’m in a spiritual context, I often want to start a Breathe session manually, so the complication is in the bottom right of this face. The moon phase is something I just like to be aware of for general space nerd reasons, but it also marks the passage of the Jewish months. There are lots of great ways to track the moon phase built into watchOS, but I use the Sky Guide complication because it’s more realistic than the stock one, and because launching the app provides a nice bit of local astronomical info. I use the iPhone part of this app to check out the celestial conditions all the time. The app in the middle is the kind of thing that would sell an Apple Watch to every single religious Jew if they knew about it. It’s called Ultimate Zmanim, and it keeps track of the daily prayer times, which are generally based on the sun’s position and so are different every day in every location on the planet. You need an app for this. Fortunately, there is one. The Hebrew in the bottom left is the complication for Siddur by RustyBrick, which is my favorite digital prayerbook (that’s what a siddur is). I’ve set it to display the Hebrew date, which the built-in iOS calendar can actually do, but I prefer the Hebrew text of this complication, and I also launch the watch app — believe it or not — to read certain prayers and blessings that are short enough to be nice to read on a watch. In the middle is the built-in sunrise/sunset complication, which is another bit of Jewish prayer information that’s good to have at a glance. This face provides the information I want at a glance most of the time. Since the important prayer and meditation reminders come to me as notifications, I only use the Prayer face when I’m doing spiritual stuff, and if I’m just doing my normal thing, the Main face is the best compromise. The third-party apps are Sky Guide, Fantastical and Drafts again. I just use the stock Weather app’s temperature complication, and this is usually where I monitor my Activity rings. I love the multicolor Modular face for making these disparate kinds of info easier to tease apart, and especially for making the Activity rings different colors. I even wear my Apple Watch to sleep. This requires finding time during the day to charge it, which has never felt terribly inconvenient, though I still can’t wait for the watch to have multi-day battery life. In my experience, the battery only loses about 10% overnight, though, and that’s with an app tracking my sleep quality. That’s because the watch’s biggest battery draw is clearly lighting up the screen, and I disable Wake Screen on Wrist Raise every night before bed (more on that in the Dock section). I didn’t do that for the first few nights, and my wife let me know right away how much she loved getting blasted in the face by an OLED all night. What she really does love is that my Apple Watch is my alarm clock. I leave the sound off at all times on my watch because being silently tapped on the wrist is so much more civilized a way to be notified of something. Thus, when my alarm goes off, I am awakened gently and silently, and my bedmate is not disturbed. I set the Sleep face to red because it’s much easier on the eyes in the dark. I have no idea why Apple Watch’s Nightstand mode displays the time in green; it’s freaking blinding. I don’t use Nightstand mode at night, obviously, but on behalf of those who do charge their watch by their bed, I implore Apple to give that mode color settings. Or just make it red. The central feature of my Sleep face is Sleep++ by _DavidSmith, arguably the greatest developer on the watchOS platform. You turn this app on right before you go to bed, and it tracks how long you sleep as well as whether you’re still and restful, moving around restlessly, or moving so much you must be awake. It seems quite accurate and sensitive to me, which is amazing for an app that’s not built into the device. Unfortunately, Apple’s Health app only tracks the overall sleep time data so far, but Sleep++ is dutifully keeping all the motion/sleep quality data, and hopefully Apple will add it to the platform soon. Converting the watch between awake-mode and sleep-mode is a bit more fiddly than just switching faces, since I have to toggle raise-to-wake in Settings and start or stop sleep tracking in Sleep++, but I don’t see how that can be avoided. Launching Sleep++ from a complication is easy. I wish the raise-to-wake toggle was in Control Center instead of buried in Settings. I’ll explain the only solution I’ve figured out to reduce the friction there in the Dock section. I have Sky Guide on this face because the moon is nice to think about at bedtime, and the sunrise time helps me determine when to wake up. Siddur is also on there for bedtime prayers. When I’m traveling busily by foot, especially in a new place, I find I want slightly more focused information than I get from the Main face. I set my Travel face to bright green to be highly visible in sunlight and set a lively mood. I use the biggest view of the stock Weather app’s complication on this face, and I have Maps in the upper left corner. My inclusion of Maps is a bit more aspirational than actually practical, because I don’t find the performance of the Maps watch app to be very good, at least on the Series 0 hardware. I usually just see a blue dot in the center of a blank grid. The app has all the right shortcuts, though, including location marking, shortcuts to home, work, and nearby places of interest, and even voice-to-text search. When the map works, it’s usually pretty laggy and screwy with what direction you’re facing, but it has come in really handy a few times. Even without the visual interface, the app does a good job of starting and stopping directions that run on the much more capable phone, and the tapping cues for turns are enough to make maps on a watch feel magical. And yes, I find Apple Maps data to be perfectly good, even in Israel. Because I often need to make note of things while doing such adventuring, I include Drafts again on this face, as well as my preferred audio recording app, Just Press Record. Not only does this enable me to quickly capture the sounds of my environment, it works perfectly without a data connection, which means even if my phone isn’t online — or with me at all — I can capture things as audio on my watch and work with them later. That means I sometimes use it just for offline note-taking, since the dictation in Drafts doesn’t work without a data connection. This is my least-used face, but it’s necessary in one particular situation. I travel with a Nomad Pod Pro charger, an amazing little gadget that packs about five days of watch charges in my experience (it can charge the iPhone as well, but obviously that uses up the juice much more quickly). The watch charges on its back on this charger, so it doesn’t show the battery state in Nightstand mode, it just shows the watch face with the device locked. So the only way to quickly check the charge level is to tap on the screen, provided you’ve first selected a watch face with the battery complication. Voilà. The above faces were all I had for a while, but I gradually realized there was one more context in which none of them were quite right. At the end of the day, if I’ve completed my Activity rings and have no pressing tasks left to do, I just want my watch to tell me the damn time and look pretty. Due to the aforementioned space nerdery, I prefer the Astronomy face for this. Sometimes I switch it to the moon phase view, but more often I like the Earth view because it’s bright when the sun’s up and dark when it’s down. Plus it’s cool to see the Middle East on there this year instead of California. I wish I were cool enough to be able to read the solar system view like a clock and use the positions of the planets as meaningful ways of telling the time, but my perspective is just not cosmic enough. No way. I don’t know how many decades you have to read the time exclusively from the hands of an analog clock for you to be able to tell time from them as quickly as you can from actual numerals, but my brain has not reached and will never reach that point. Every time I look at an analog watch — which I do on Shabbat, since that’s no-computer day — it takes me one heartbeat of panicked concentration to compute the time from the watch hands in my brain. On a digital display, it takes 0.00 seconds and 0.00 effort. Apple Watch gives me a choice, so the choice is pretty clear. And here’s a Pinterest board of my overall watch aesthetics, including ones that are so expensive I think it would be morally wrong to buy them. My watch face complications cover maybe 75% of my app launches. For 20% of the other 25%, there’s the Dock. The arrangement of apps in the Dock is also subject to the left-right split mentioned at the beginning of the post, but the Digital Crown works here, so the order matters much more. The apps in the middle are the ones I use most often, except for those I use so often that they’re almost certainly already on the watch face. In a given session, if I need to add an app to what I’m doing that’s not on the face I’m using, I’ll launch it from the Dock, so even when I’m back on the watch face, I only need to click the side button and tap the screen to get back to it. This is the guaranteed way to return quickly, as opposed to double-clicking the crown, which might launch a different app if I’ve used one more recently than this app. No matter which app I’ve been using, the other two high-priority spots are at the ends of the list, since I can just crank the crown one way or the other and always land on the right app. I’ve reserved these spots to compensate for the two biggest UX problems with watchOS 3. At the bottom end of my Dock is Settings, which I only need frequent access to because I need to turn off raise-to-wake when I go to sleep, as I mentioned. I really wish this toggle were a Control Center item. It’s at least as important as the other six things in there, and arguably way more important than AirPlay, which I don’t know if I will ever do from my watch unless, someday, it’s the only device I have with me. The other end is Now Playing, which in previous versions of watchOS was available by swiping up from the bottom of the screen from the watch face. That was the one thing about watchOS 1 and 2 that was exactly right. It made it so easy to play, pause, or skip when listening to something on your phone while on the go. In watchOS 3, Apple changed that swipe-able Control Center to have device settings in it, and they relegated Now Playing to the Dock. The real problem is that it still doesn’t count as a proper app, so double-clicking the Digital Crown won’t bounce you straight to Now Playing, even if it was the last thing you used. The fastest way to control media playback from the watch is now to click the side button, crank the crown to the end of your Dock, tap the screen to launch Now Playing, and then tap again on the controls. It’s ridiculously slow compared to before, and it’s almost always easier now just to control it from the iPhone’s lock screen, which kinda negates the point of wearing the watch. I’d prefer Apple fix this with an aggressive solution, which is to insert Now Playing above Control Center when you have media playing. But they could at least mirror iOS 10 and put Now Playing on a second page of Control Center to which you can swipe over after swiping up. But for now, this clunky-as-hell implementation can only be mitigated by putting Now Playing at the end of the Dock. At least if I’m listening to a podcast, the other way I’ve addressed this problem is with one of the apps in my Dock I haven’t mentioned yet, Overcast. It’s my podcast player of choice, and since it’s a real app unlike Now Playing, the double-crown-click works for jumping back to the controls from the watch face. The app hasn’t been updated for watchOS 3 yet, though, so it’s still super slow to launch. That pretty much makes it a wash with either going to Now Playing or using my phone. I hope the Overcast watch app is updated soon, because podcasts are usually what I’m listening to when I’m walking around and don’t want to take my phone out. Another app in here I’ve yet to mention is Mobile Mouse Pro, which connects to a Mac over a local network and lets you control it. As crazy as that sounds, I don’t actually use it as a wrist-cursor. That app is in the Dock because while we’re in Israel, my short-term TV-watching solution is my Mac plugged into the TV via HDMI. When I’m watching something in VLC on my Mac, Mobile Mouse Pro can be my wrist-mounted remote control. Back in Cali, where I have a pre-App Store Apple TV, this spot in the Dock is occupied by Apple’s Remote app. You’ll also find Messages in my Dock. Yes, I actually use Messages on the watch, even for proactively writing and sending messages. I think the scribble pad is amazingly accurate, and of course dictation is also rather good in situations where it’s appropriate. The last resort for launching apps on the watch is the Home screen, which offers a pretty bad user experience. Arranging apps on the Home screen onboard the watch is practically impossible because the icons are tiny and the grid snaps in totally bizarre, unpredictable ways. Fortunately, as of iOS 10/watchOS 3, you can now manage the Home screen on the phone, which is slightly less crazy-making. Management of the Home screen is by far the worst part about Apple Watch. I have only found one allowed configuration that is stable enough to be used, which is an oscillating column that goes from one to five apps wide. It was extremely difficult to set up, but my Home screen is now fairly easy to navigate. The key to this arrangement is that it only has one scrolling axis. It’s impossible to remember where anything is on this tiny screen if you have to swipe around in four directions to find it. This way, at least I can be assured what I’m looking for is either up or down. The Home screen usually reverts to the watch face icon as the center, so I put that all alone and treated it as the starting point. I tried to surround it with only essential apps, which would be easier to launch without being crowded by others, and put slightly less important apps in the next few layers on either side. I chose up as a higher-priority direction than down, so all the somewhat important apps can be found from the watch face on up. The downward direction is just a dumpster fire of apps I could conceive of someday wishing were on my watch. I really tried to make the app clusters meaningful, but it was difficult and annoying, so I gave up after a while. I use Wallet and Apple Pay all the time in the States and in countries where such things are widely used. Paying for things, entering a venue, or boarding an airplane using a thing strapped to your wrist is incredibly convenient. The one drawback is that you need the other hand to get the screen ready. One-handed mobile passes and payments are actually only doable on the iPhone. But if you pull up the QR code while you’re waiting in line, you can then swipe into your event or your flight without having to hold anything. I have a bunch of bands because I am gross, but two dominate my everyday use. My primary band is the brown aged leather band from Clockwork Synergy, and I switch to a midnight blue Sport Band for sleep. I switch it up to the black Leather Loop sometimes, and I have the black and saddle brown Classic Buckles for dressier situations in which it is still (marginally) socially acceptable to wear a computer watch. Before the Clockwork Synergy band, I wore the original Nomad leather strap, but one of the lugs crapped out and wouldn’t lock into place. I also didn’t like the clasp on it; it was too big and jagged. They have a new model since then that might be nicer. Ugh, yes, I have more bands. I have additional Sport Bands in orange, royal blue and black, a purple faux-Sport Band that’s terrible, and the Woven Nylon band in the first-generation blue-and-yellow color they don’t sell anymore. Beyond bands, I have the Nomad portable charger that I mentioned, and a simple maple charging dock for my desk that I bought on Etsy. The Nomad holds so much juice that I don’t ever pack the dock, I just bring the battery on trips and charge it back up every four or five days. And you’d better believe I’m gonna get me some AirPods when I’m next back in the States. When I upgrade my watch, I’m pretty sure I’m going to switch to gold aluminum from space gray. Since I bought this watch, I have added a gold wedding ring to the same hand, and — what can I say? — I like a little flash of gold. I’ve checked in the store, and the gold Sport watch matches my ring pretty well. I bought gold-aluminum lugs for the Clockwork Synergy band in anticipation. I don’t like the steel watch. Too shiny. I was pretty sure I was going to get the Series 2, because the only two hardware complaints I currently have are the screen brightness in sunlight and the lack of GPS without a phone, both of which are corrected by Series 2. But since being in Israel has prevented me from impulse-buying Apple stuff, I’ve found that the Series 0 is actually good enough for me right now except in the one respect in which Series 2 is not meaningfully better, which is battery life. It’s reportedly better, but it’s not reliably multi-day. So I’m going to hold off for the next update, which is rumored to be later this year and be mostly focused on battery life. It would be nice if Apple uses that battery gain to allow an always-on display, as John Gruber hopes they will. Raising the watch almost never fails to turn on the display for me, though, and I like knowing that nothing on the screen will get touched while I can’t see it. I think I’d rather have an Apple Watch that goes six days without a charge than one with the screen on all the time. Since I only wear it six days a week, that means I would never have to think about charging it again. Oh, which reminds me: Hey Apple, how about giving us a Shabbat setting for our fitness streaks, so Saturday doesn’t count? What are Jews supposed to do? _DavidSmith’s Activity++ let’s us do it. Jews like badges, too! Yes, I have a few gripes about Apple Watch, but I obviously love the thing overall. I know people are worried about Apple’s direction right now, but I’m totally optimistic about a future in which most computers are little tools like iPhone and Apple Watch. The future of big computers are a different 5,000-word blog post, but Apple is lightyears ahead when it comes to the tiny ones.